Study culture, history, linguistics, translation and much more to acquire practical skills in French and Spanish. Why study French & Spanish at UBC’s Okanagan campus? 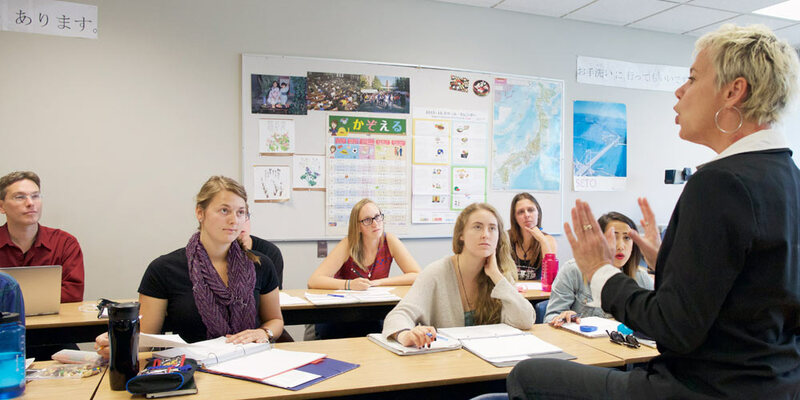 Whether you want to teach French or Spanish, be a journalist, embark on an international career, hold a federal position, dream of being a politician, or work in other Hispanic or Francophone cultures across the globe, a UBC degree in French and Spanish can lead to all sorts of great opportunities. For students looking for an international perspective, the study of both French and Spanish provides an avenue of study to several regions of the world. The French and Spanish major offers students a comprehensive learning experience that includes such international opportunities as the Go Global study abroad program, English-language teaching assistant in France, and International Partnerships. Acquire strong fluency in French and in Spanish through courses in grammar, conversation and translation, while exploring all aspects of Hispanic and Francophone studies, including culture, literature, cinema, history and politics. The core of the Bachelor of Arts (BA) degree program with a French and Spanish Major consists of courses in French and in Spanish covering language, literature and culture. The language-learning aspect of the program covers practical skills and daily application of both languages, as well as skills that are transferable to a work environment and an academic setting. The language courses are designed to improve skills in reading, composition and oral communication, and foster critical analysis of cultural material and intercultural understanding. Students have the option of spending a semester abroad studying and experiencing life in a Spanish-speaking or French-speaking environment. Students may supplement their major with a cross-disciplinary approach by taking related courses in Latin American and Iberian Studies, Political Science, International Relations, Cultural Studies, Human Geography, Anthropology, Economics or History. These additional courses contribute to the broadening of students’ understanding of language and communication. UBC Okanagan’s French and Spanish program offers a wide variety of foundational and advanced courses that cover linguistics, translation, literature, culture and more. Browse here for more French and Spanish courses and descriptions and program requirements. Undergraduates can complete a BA with a major in French and Spanish by completing 54 credits in French and in Spanish combined, with 36 credits at the 300 and 400 level. After obtaining your BA with a major in French & Spanish, you can apply to the 16-month Bachelor of Education program to complete a teaching degree. You can specialize in teaching French as a second language (French Immersion, Core French) or French as a first language (in a Francophone school). Students are encouraged to declare their major in Spanish at the end of their first year in order to take the prerequisite second-year courses. Refer to the Academic Calendar for required courses. Apply to UBC’s School of Engineering at you.ubc.ca—there are just five steps in the application process. Soon you could be studying at one of the world’s top universities. Earn a UBC degree respected by employers around the globe, and secure a career as a bilingual educator, community worker, development agency worker, or translator; or continue your education to work in professions such as law, teaching, and international relations. Learn and earn with Co-op, a paid opportunity for students to enrich their education with work experience. At UBC’s Okanagan campus, sign up for Co-op to: build your resumé with professional experience; learn valuable tips on how to successfully apply for jobs; expand your network of industry contacts; and earn money to pay for tuition. Inquire about Co-op by phone at 250.807.9623 or by email. Obtain a DELE Diploma, an official and international accreditation of a person’s degree of proficiency in Spanish. DELE Diplomas are internationally recognized and enjoy great prestige—not only among public and private educational institutions and authorities, but also in the business world and chambers of commerce. DELE Diplomas are granted by Instituto Cervantes on behalf of the Spanish Ministry of Education. After obtaining your BA with a major in French and Spanish, you can apply to the 16-month Bachelor of Education program to complete a teaching degree. You can specialize in teaching French as a second language (French Immersion, Core French) or French as a first language (in a Francophone school). Students can pursue a master’s or PhD through the Interdisciplinary Graduate Studies (IGS) program at UBC Okanagan. The IGS program allows students to develop multi- and interdisciplinary course and research programs to suit their interests. Exchange programs such as the federal government’s Explore program and the Language Assistant Program offered in partnership with the French Government are available to students majoring in French. Contact the French Program Coordinator for more information on how to apply. Travel to conferences or competitions with financial assistance available through the Tuum Est Student Initiative Fund, which provides financial support up to $3,500. Follow your ideas and get a head start on your career. Our professors engage students in research projects, labs and centres that range from Indigenous studies and the study of animal ethics to digitized cultural history. Take part in Eco Art Incubator, a research initiative that provides students and artists with a platform from which to work, as well as access to artist-friendly resources for conservation and ecological initiatives. Investigate opportunities offered through the Centre for Culture and Technology (CCT), an interdisciplinary institute that engages in multiple forms of art, media, and information technologies as vehicles for the exploration and expression of community, culture, and identity. Work collaboratively with artists and communities at the Centre for Indigenous Media Arts (CIMA) and foster contemporary artistic practices of indigenous media artists. FCCS faculty run the AMP Lab, which houses projects that engage the work of the humanities, adding value to cultural artifacts through interpretation and analysis in a digital context. The Faculty of Creative and Critical Studies Undergraduate Research Awards ($2,500) provide undergraduate students with support you can use to engage in research and creative activities during the summer. The FCCS Community Engagement Award recognizes activities that make a significant and positive impact on communities beyond the university. More scholarships, bursaries and grants available for all students. Meet a community need and get practical experience by volunteering for a Community Service Learning project— a life-changing experience. Build up your portfolio by flexing those creative muscles — photograph, illustrate, write, edit, interview and perform other journalistic roles at UBC Okanagan’s newspaper, The Phoenix, the official students’ free press. More Employment Opportunities in FCCS. Find out what students, faculty, and alumni have to say about UBC’s Okanagan campus: ourstories.ok.ubc.ca. Follow our French program on Facebook to keep up to date on events and our French community on campus and beyond. Join a community of fellow creative and critical thinkers at events such as the Visiting Artist Series, Draw by Night, AlterKnowledge Discussion Series, and more. Branch out, get involved in student life, and have fun by joining a campus club or association. If you don’t find a club that interests you, you can start a new one!